Smartphones are increasingly becoming the remote controls of our lives. They allow people to program their homes’ lighting fixtures and thermostats and track energy use. Some car owners can use theirs to check on the battery levels and adjust the climate control system. At MIT, researchers have been thinking about expanding the role of smartphones to help drivers save gas (or electricity). The project, called SignalGuru, involves using many smartphones mounted on the dashboards to take images of traffic signals to figure out the frequency of the green and red lights at various intersections. The data, collected through crowdsourcing, will then be analyzed to predict how quickly the lights will change. The phone will then tell the drivers when to slow down so that they can avoid having to stop and start the car when the traffic signal goes from red to green. The idling and accelerating of a car requires energy, or course, and that energy adds up over time. In fact, minimizing this stop-and-start move has shown to reduce fuel use by as much as 20 percent, the researchers claim. Designing fuel-efficient cars is something carmakers can’t avoid. Federal regulation requires the average fuel economy to reach 54.5 miles per gallon by 2025. The transportation sector accounts for about 33 percent of the emissions from fossil fuel combustion in the country, according to the U.S. Environmental Protection Agency. Cutting fossil fuel use will save both money and the environment. Emmanouil Koukoumidis, a visiting professor from Princeton and the leader of the SignalGuru project, sought to take advantage of the growing number of people who use their smartphones as navigation devices. 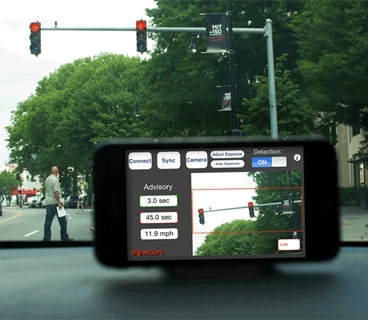 By combining the image-capture and analysis features, the smartphones used in the project would display a recommended speed to help the drivers avoid stopping at the next red light. Koukoumidis and other researchers have run field trials in Cambridge, Mass., and Singapore. To keep the drivers’ eyes on the road, however, the researchers believe the recommended speed should be conveyed by voice, much like what stand-alone navigation devices do. Better yet, the two can combine their functions so that one device will tell the driver to slow down or take an alternative route to achieve the best fuel efficiency, Koukoumidis said in a press release. Other potential uses of a SignalGuru device include snapping photos of parking lots to determine the availability of parking spots. Carmakers also have been working on marrying GPS with other communication tools for a variety of uses, from avoiding accidents to cutting fuel costs. Ford is working(s f) on technologies that will allow cars to talk to one another. Toyota and Microsoft,(s tm)(s msft) meanwhile, are developing mobile apps and other software and hardware to make it possible for cars to communicate with homes and the electric grid to accomplish tasks such as figuring out the best time to charge cars. General Motors (s GM) announced on Thursday that it will work with LG to design electric cars, and one of its plans is to make use of LG’s expertise in consumer electronics and communication equipment designs and manufacturing for creating telematics systems inside the car. Many of these projects are in the early stages of development, and consumers won’t find those technologies inside their cars for many more years. Already, the idea that future cars will come with a built-in and sophisticated communications network has prompted concerns about security breaches. But without a doubt, using technology to reduce our energy use will always be a good thing. Great idea! Absolutely love it. This sounds like a great idea! GPS Navigation should begin to include red light wait times into its calculations.